This Equipment is used in Steel Plants for feeding hot ingots to rolling mills for rolling into steel sections like flats, rounds, channels etc. 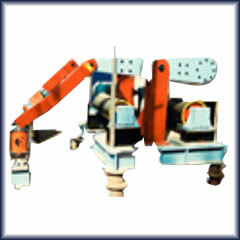 As the name suggests, the top roller clamps hot ingots and is conveyed in forward direction by driving the bottom roll. At fixed clamping pressure is maintained between the two rolls by a pneumatic / hydraulic cylinder located at the rear side.